The Unlimited Potential Project is going to shine a spotlight on some of our Sports Unlimited athletes around the world to acknowledge their sporting achievements because family involvement, community involvement, and playing sports we love are such important parts of life. 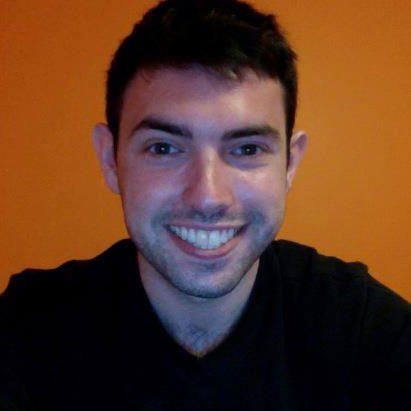 Relatively new to SportsUnlimited.com, I (Isaac) have been striving to provide content on the blog and e-commerce site that is engaging and positive for the sports community in general. While it does help for SportsUnlimited.com to sell products, the idea is to not just provide the newest, coolest, and best products to the customer, but to provide the right product that will make that customer the happiest. This has led me to develop a side project that allows me to have a bit of fun and not sell, sell, sell with something I’m calling “The Unlimited Potential Project”. 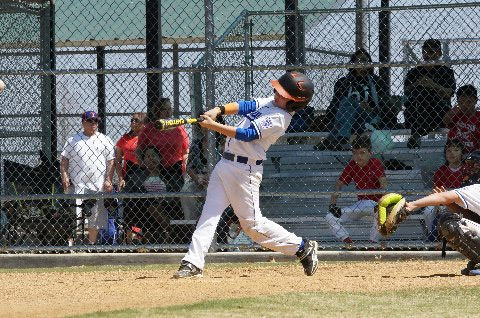 Ryan plays ball for Brooklyn in the North Texas Little League and has had quite the year. Primarily a catcher, Ryan has also put in some time as a pitcher and third baseman, but his favorite part of baseball is, in no great surprise, hitting! 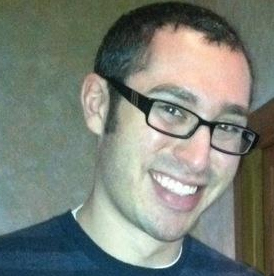 Using his skills as a switch hitter, which he has honed since he was just five years old, Ryan leads the team in RBIs. Through natural athleticism, great focus and instruction from his hitting coach, JT Blair, Ryan has had many keys hits this year to help his team to a 12-1 record, which has Brooklyn tied for 1st place in the league. One example of his prowess as a hitter occurred early in the season with a lot on the line. In a game against arch rival Yankees (12-1), Ryan was up to bat with 2 outs and the game tied. Providing Brooklyn with some clutch hitting that the team has become accustomed to seeing from Ryan, he drove the ball to the opposite field and went on to win the game by a score of 6-5. Being able to achieve consistent success for the team in critical situations signifies the drive and the ability of an extraordinary player even at such a young age. Hitting can often times affect the result, but defensively, the skill of the catcher affects the game every single inning. 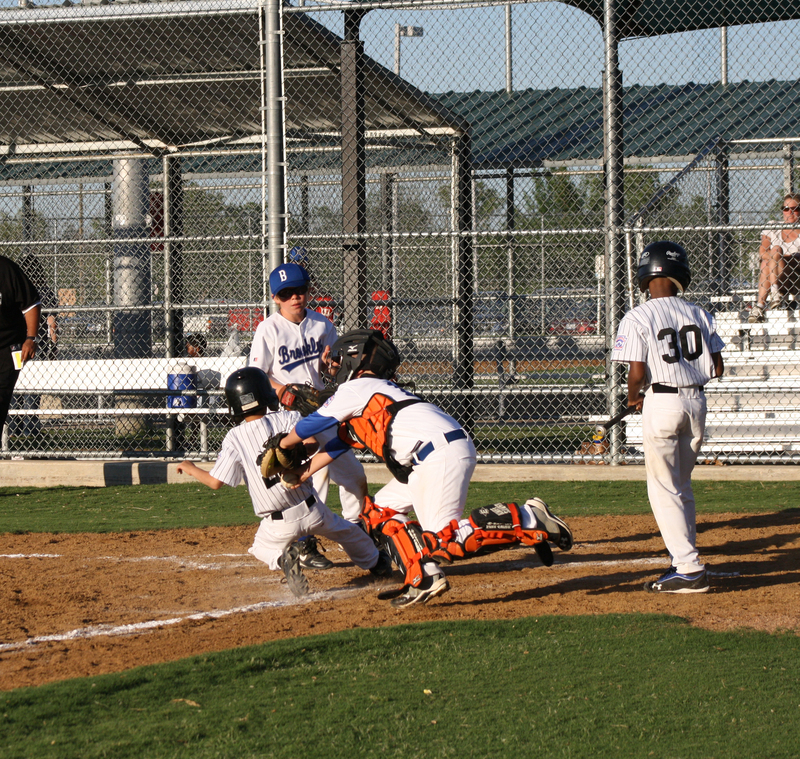 The catcher must work with the pitcher, block pitches, block the plate, throw out runners attempting to steal, and keep the defense in control of the inning. 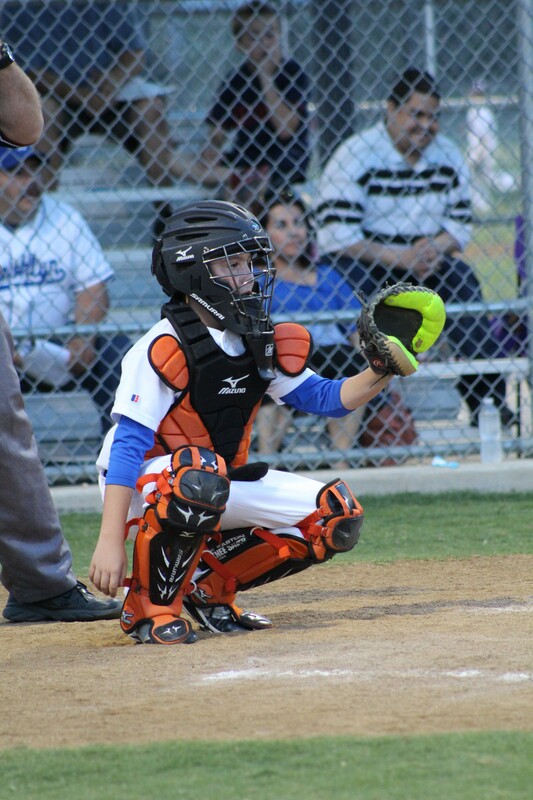 Ryan’s poise behind the plate has come to him not only because he has the innate ability of a catcher, but because he practices hard and trusts his protective gear. His father, Joe Marquez, and some of the other coaches have worked with him over the past year on getting quickly to his knees and taking short hops and bad pitches off his chest protector. When we see major leaguers, not so much Mike Napoli anymore, but perhaps someone like Yadier Molina, blocking a bad pitch in the dirt, we take for granted how difficult it is to willfully put our bodies in the way of a pitch to prevent runs. Ryan, through his desire to help the team in any way he can, does just that, in what he calls, his “Samurai Warrior Gear“. With remarkable intuition and secretive hand signals with his first baseman, Isaiah Escalona, Ryan uses ‘snap throws’ to pick off unsuspecting runners who have strayed off base. If you fall asleep on first, Ryan and Isaiah will get you out before you even realize it happened. With clutch hitting, smart defense, and all-around athleticism, Ryan is a Little League All-Star in his league and an Athlete of Unlimited Potential for SportsUnlimited.com. We are proud to highlight Ryan’s year and wish him and Brooklyn the best of luck in the playoffs. I’d like to extend special thanks to Ryan’s very gracious father, Joe Marquez, for his willingness to participate in the project. Do you think you or your son/daughter is an Athlete of Unlimited Potential? Shoot me an email at iclark@sportsunlimited.com with your story and for all of your youth catchers gear and other baseball needs, shop Sports Unlimited! By Isaac ClarkIsaac is a writer at Sports Unlimited. Behind the plate, you need that perfect combination of lightweight performance and durable protection in your gear, to enhance your natural abilities and keep you off the DL. 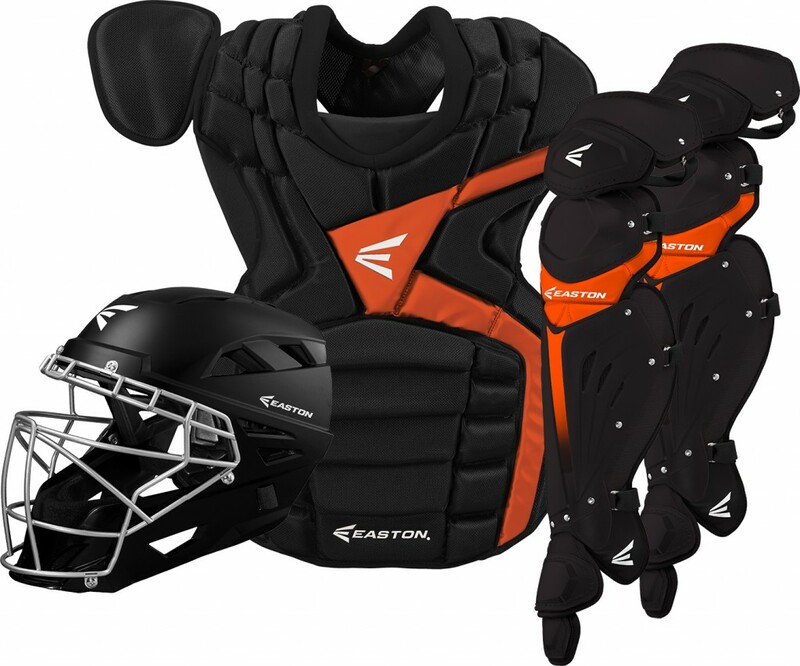 Thankfully, in 2012, the three big names in baseball catchers gear are back with new catchers sets that combine industry experience, technological advancements, and new performance materials to improve your game like never before! Play like a pro, and look the part too, in this advanced and striking catchers gear set from the masters at Nike. Designed for advanced, adult catchers looking to up their game, each piece in this set is built for lightweight manuverability, comfortable ventilation, and tough-as-nails durability. We particularly love the Camo Cage technology in the helmet, which tints the inside of the facemask giving you a clearer, unobstructed view of the field. Lightweight four-layer chest protector, designed with Dual-Density Energy Arrest Padding, that kills ball rebound, to keep wild pitches in front of you and speed up throws out to the field. Layer of “diamond vent pattern” padding vents out hot air and reduces the weight of the chest protector. Precision Protection System in the shin guards shifts protection to the medial side of the leg, covering high-risk areas not normally protected. Reinforced high-wear areas keep the shin guards playing like new longer. 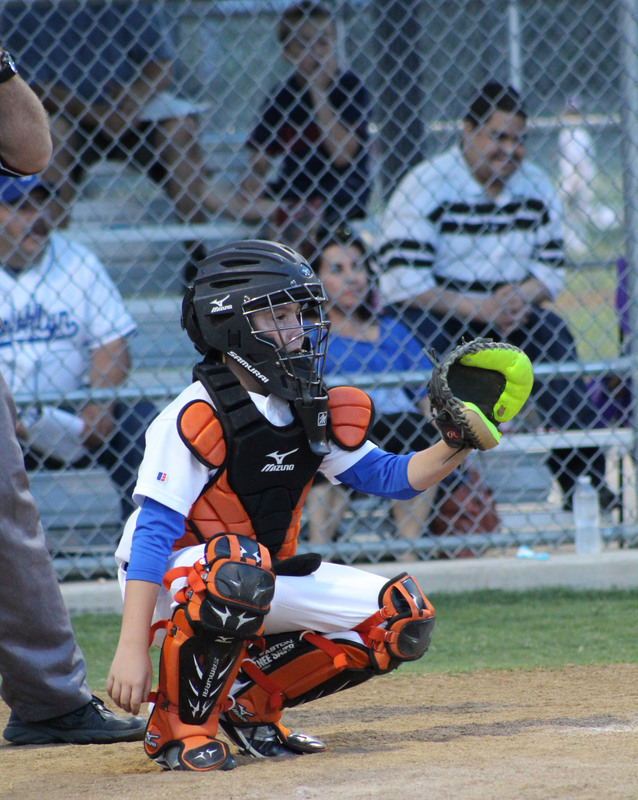 The next generation of Mizuno quality behind the plate; the G4 delivers improved comfort, ventilation, protection, and performance for the youth catcher. Trusted by parents and loved by players all across the country, Mizuno catchers gear is designed for serious, competitive play and high performance. The new Samurai G4 catchers helmet improves on last year’s popular design, with a 3-layer, impact absorbing EVA foam liner and adjustable, moisture-wicking jaw pads, for a safer, more comfortable fit. The Mizuno G3 chest protector uses a DryLite liner to wick moisture and lessen weight, for quicker manuevering. 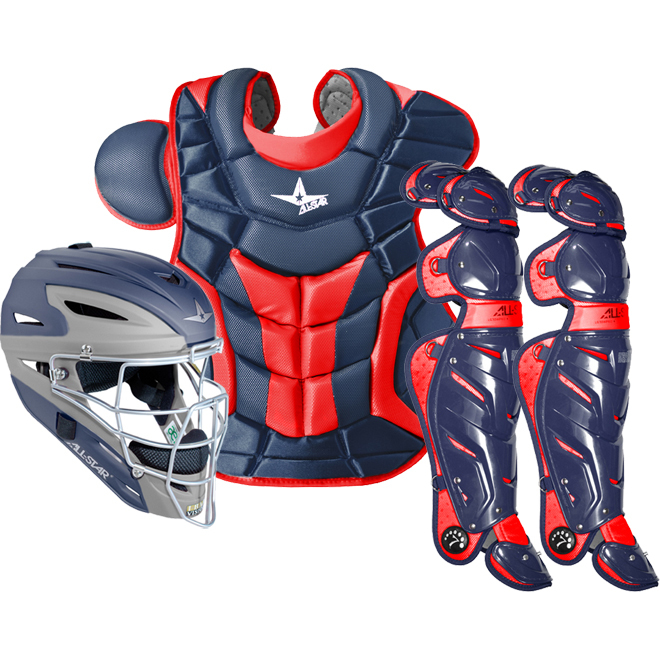 Detachable, customizable wings and shoulder pads let you strike the perfect balance between protection and performance. Flexible, durable, and protective, the Mizuno G3 leg guards utilize a detachable kneepad and triple knee cap, for maximum performance and fit. Stainless steel buckles and a Grip-Tech slip-proof coating maintain the perfect fit all game long. Built with innovative Under Armour technology, performance materials, and strikingly intimidating style, the Under Armour Pro Series Catchers Gear Sets are perfect for the serious catcher of any age. With sets designed for adult, senior, junior, and softball catchers, Under Armour gives everyone the quality, performance, and comfort they need behind the bag. Chest protector enhanced with plastic throat, shoulder, and abs inserts, plus low-rebound foam to keep the ball in front of you. Shin guard with triple knee cap and thicker plastic in high impact areas for maximum protection. Breathable mesh lining and 38 ventilation holes keep legs cool and comfortable all game long.